Coming to the Atlantic Shores of Ft. Lauderdale is the latest creation from Conrad Hotels & Resorts, The Ocean Resort Residences – Fort Lauderdale Beach offers top of the line luxury just steps from the white sandy beach. The 24 floor tower has space for 109 residences, and 181 Oceanfront Resort Residences already fully finished and furnished. 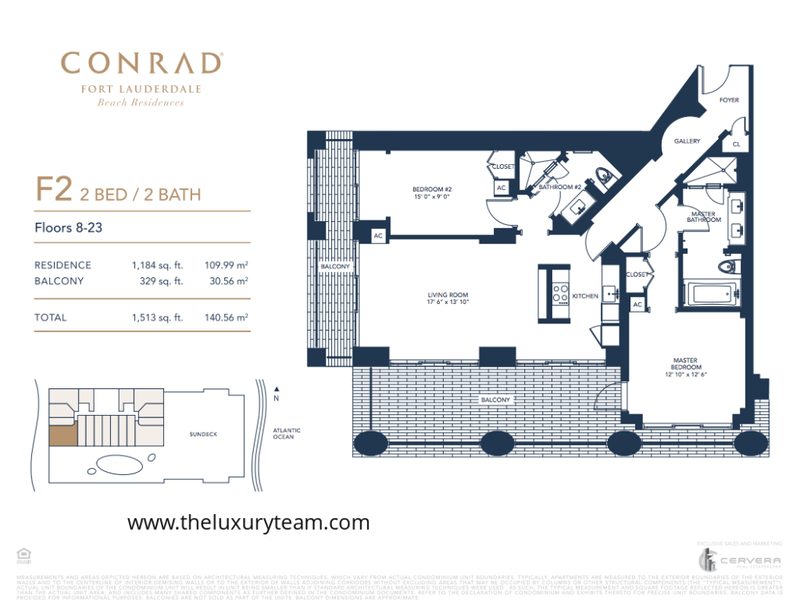 The Ocean – Fort Lauderdale Beach is Conrad Hotels & Resorts’ first residential resort property in the U.S., an exclusive opportunity to take advantage of the old-world luxury of Conrad before it becomes all the rage. Developed by Conrad and Orchestra Hotels & Resorts, owner Jose Luis Zapata is confident this new property will offer an exceptional lifestyle, not just property. The Ocean is offering residences ranging from studio to three-bedroom penthouses, starting in the $400s. The management company is offering 8% leaseback programs and other financial arrangements. Located directly on the beach, The Ocean’s indoor amenities include a 24/7 e-concierge, free membership to the 6th floor sky beach, and 20,000 ft. beachfront pool deck. Studio A1 is available on Floor 6-23 and offers an economical version of luxury. This 715 total square foot residence features a 13×14 living room, a 13×12 bedroom, and a 67 square foot balcony area. Studio A2 is slightly larger offering 724 total square feet of living space, but with ultimately the same layout and features as A1, yet more centrally located in the building. Studio B1 features a combined Living/Bedroom area measuring 13×20 feet. This open floor plan provides more flexibility in determining how it will be used. This small wonder offers just 545 total of 545 square feet of living space and a 52 square foot balcony area, just enough for a lounge chair or some plants. Studio B2 is the smallest and most economical option available at The Ocean from Conrad. 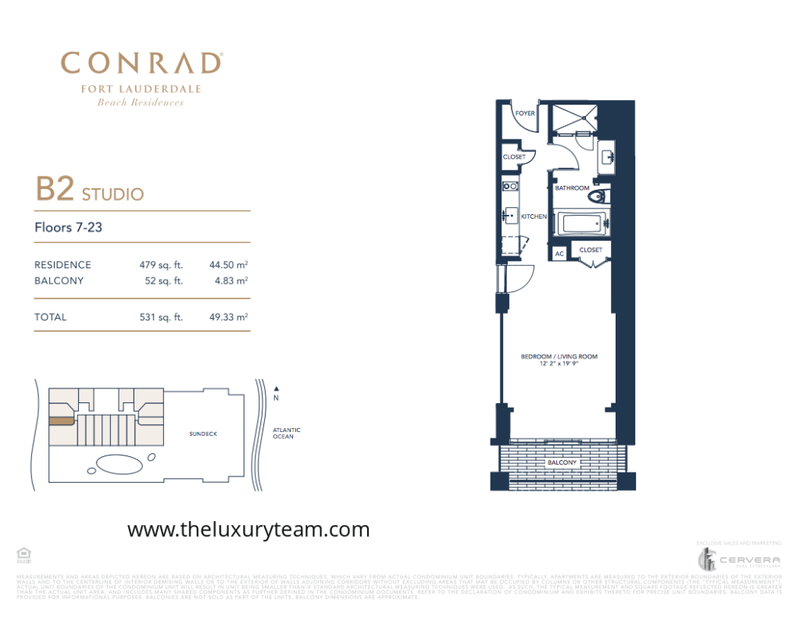 This 531 square foot luxury residence features the same floor plan as Studio B1 and A2 but in a truncated version. 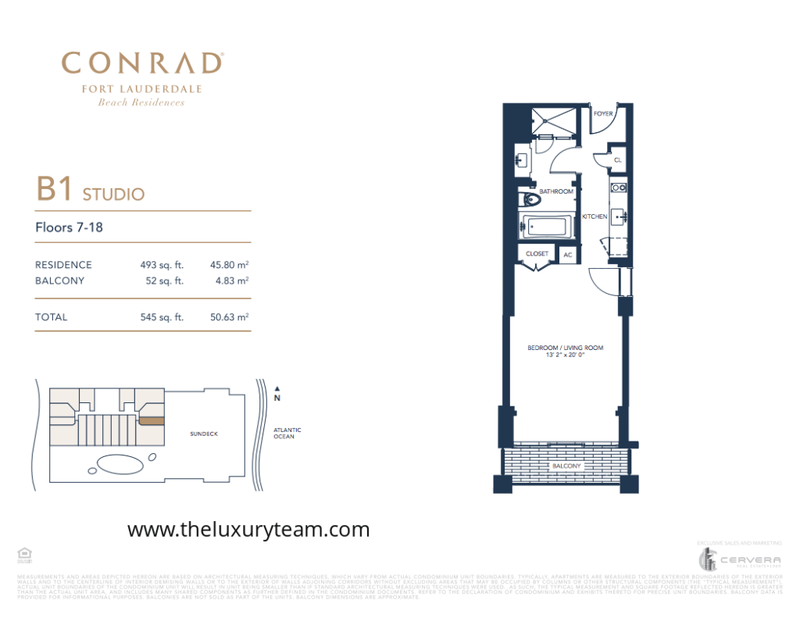 Floor Plan C is a north facing 1 bedroom, 1.5 bathroom luxury suite with 885 total square feet of living space. The unit is home to a 13×20 foot living room and a 10×15 foot bedroom area. The balcony spans both the living room and bedroom areas and totals 91 square feet. The unit features a full sized bathroom attached to the master bedroom and a powder room for guests. 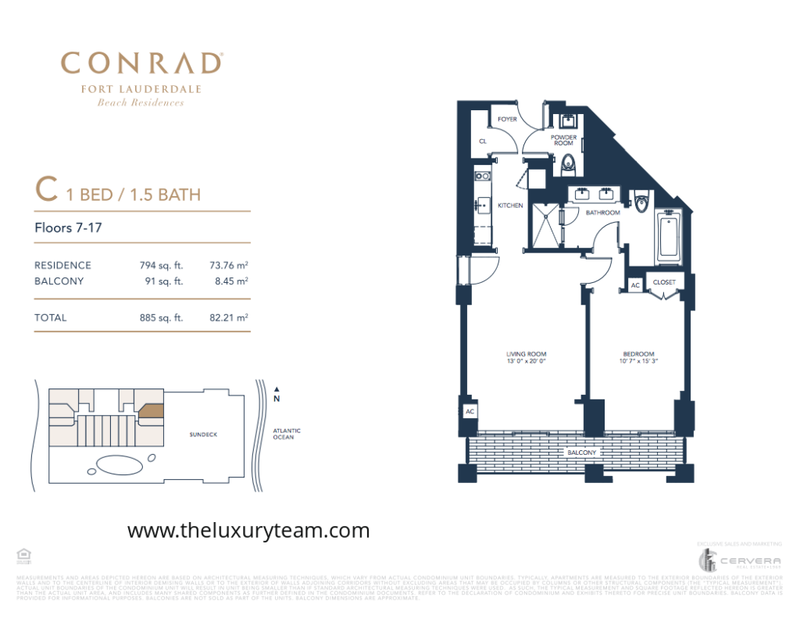 Floor Plan D is a deluxe 1 bedroom, 1.5 bathroom residence with 1,210 square feet of living space and more expansive living room and bedroom areas. 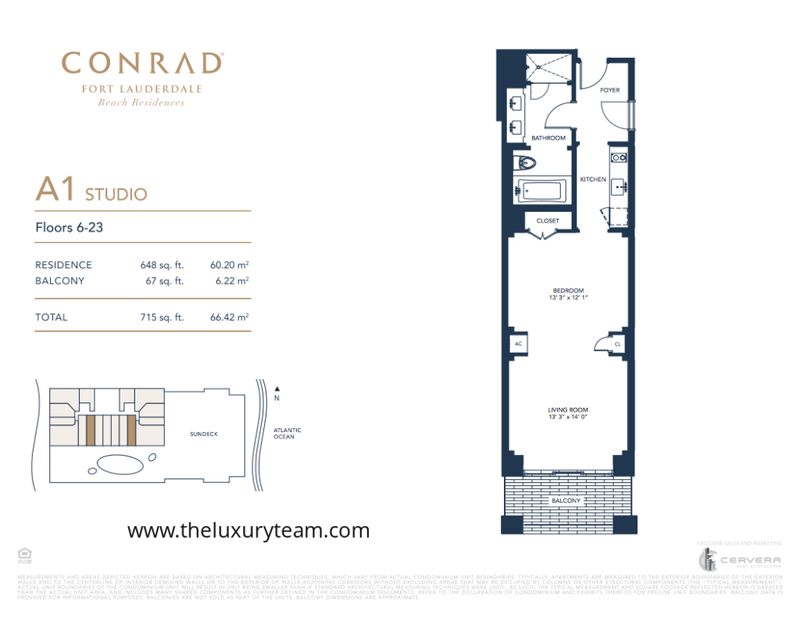 The unit also features a hallway foyer entrance and a more expansive 292 square foot terrace. The unit is also north facing and overlooking the popular sundeck area. Floor Plan E is a more economical version of the 1 bedroom, 1.5 bathroom luxury residence featuring a long kitchen entranceway opening up into a 12×15 foot living room and a 12×13 foot bedroom area. 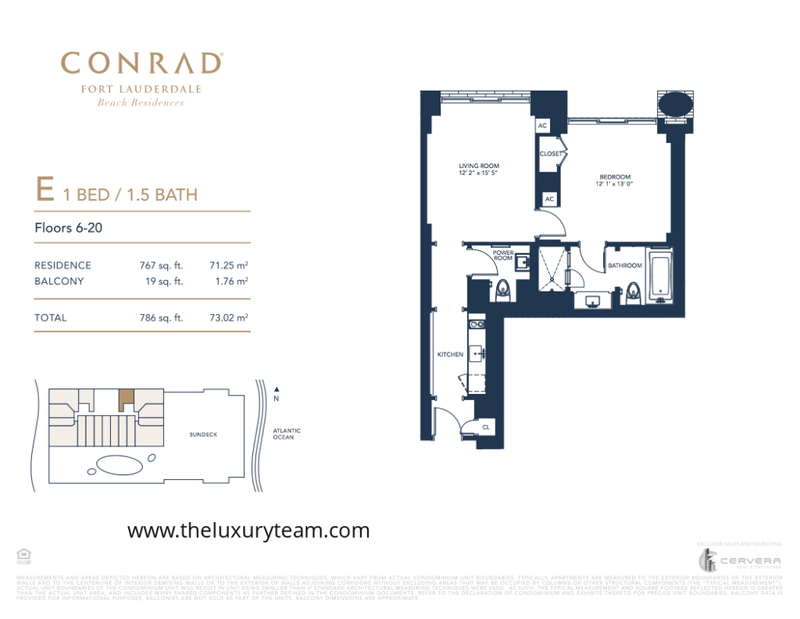 This unit offers 786 total square feet of living space and is available on floors 6-20. 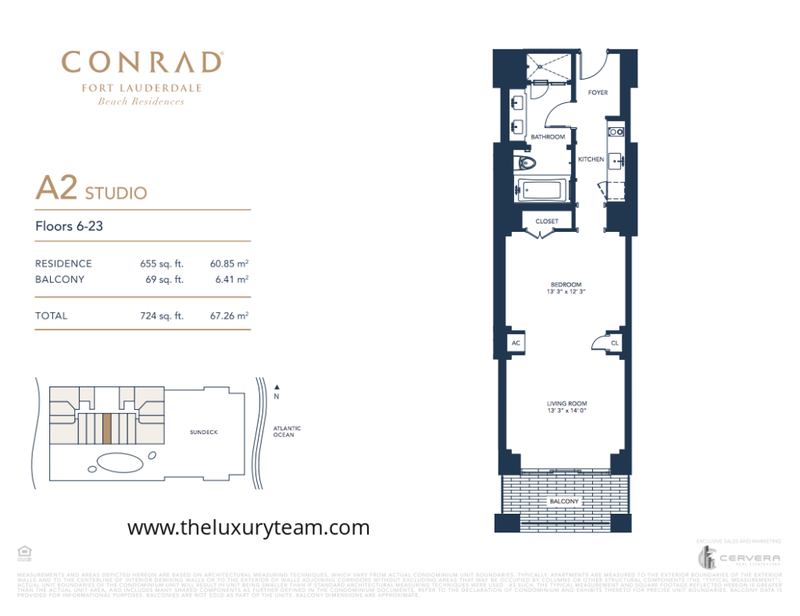 Floor Plan F2 is the most deluxe and spacious available in all of Conrad – The Ocean Fort Lauderdale luxury residence. The unit features a 17×13 living room and a spacious 15×9 bedroom. The private foyer entrance gives way to a gallery hallway adjacent to the master bedroom. The only private beach club in Fort Lauderdale, The Ocean has beachfront cabanas and complementary lounges for residents. The building will be up to date with the latest communication technologies, allowing for keyless entry systems, and remote access to appliances and heating/cooling systems. The building will have a 4,000 square-foot fitness center complete with cardio room, weights, and even a free personal trainer in your first year of residence. All units are fit with gourmet kitchens, Wolfe cooktops, and Sub-zero refrigeration units. The fully furnished resort residences come with an IMAX 80″ Projection Theatre, walk-in showers, and twice daily laundry and cleaning service. The Coral Branded Spa is right on the premises in addition to several resident only happy hour and lounge options. In addition to on-site amenities, each new resident will receive global benefits redeemable at all Conrad locations worldwide. These include a 48 hour room guarantee, and the 5th night is always free. What Fort Lauderdale attractions are near the Conrad Ocean Residences? In addition to being close to the Fort Lauderdale International Airport, The Ocean will be just blocks from the new All Aboard Florida high-speed rail line. This train will offer direct service to Miami, West Palm, and Orlando reaching top speeds of 126 miles per hour. The immediate vicinity of the resort is surrounding by restaurants, bars, and other beachfront luxurious dining options. The Ocean is also just blocks from The Galleria boutique shopping center and the heart of Fort Lauderdale. If you are looking for luxury that is world famous in a location that can’t be beat, The Ocean – Fort Lauderdale Beach is on the frontier of luxury properties in this area. Where is the Ocean Residences? Who can help me buy a condo here? 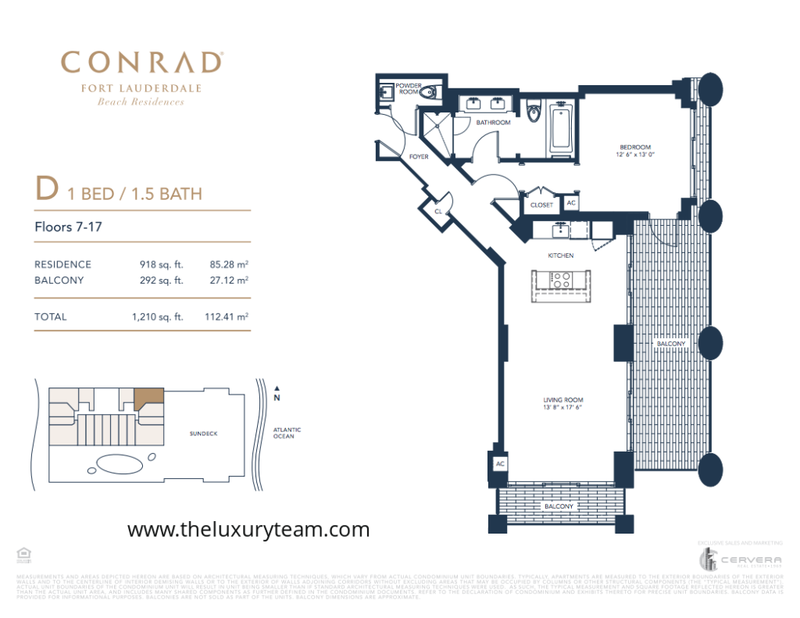 The Luxury Team understands the Fort Lauderdale condo market better than anyone else. Call us to learn more about how you can find your place in the Ocean Residences.